Meet Earl. 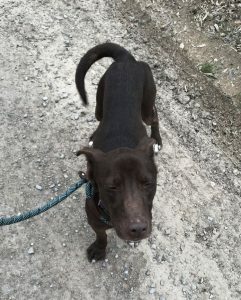 Earl is a lab/terrier mix weighing approximately forty pounds. He is energetic and a joy to walk. I snapped this quick picture while walking him last Friday. He has been neutered, had his shots, and is heart worm negative. Right now, he is at the Hardeman Adoptable Animals shelter. He is looking for someone to give him a forever home. Earl is just one of the many dogs available at the shelter waiting to be adopted. Hardeman Adoptable Animals saves the abandoned, neglected, and stray dogs of Hardeman County. They are a 501(c)3 and operate on volunteer power and donations. When dogs are received at the shelter they are evaluated, given medical care as needed, and placed up for adoption. Their facility is currently located at the Hardeman County Landfill. As funds become available, HAA is diligently working to complete renovations at their new facility so that the dogs can move to their new shelter located at the site of the old flight school in Bolivar. There are multiple ways you can help them with their daily operations and with their fundraising goals. If you are looking to give a furbaby a forever home; adopt. If you can’t make that kind of commitment to a dog but are open to fostering, complete the foster application on the HAA website. If you are able to financially contribute, your donations will make a huge difference. You can make monthly donations via PayPal or credit card, purchase items on HAA’s Amazon Wish Lists, and participate at their fundraising events. HAA received the Gold Seal of Transparency from GuideStar in 2018. You can rest assured that your dollars will be in good hands and will be used to save one dog at at time. Have an hour or two to spare? Spend it at the shelter. Walk a few dogs. Pitch in how you can. The dogs and the team there will appreciate your help. Giving the dogs a bit of much needed love will give you all the feels. If you haven’t walked a shelter dog before and are an animal lover, now is the time! Call (731) 659-3040 and schedule your volunteer hours.